We get so used to repeating the answers that we forget to ask questions. All 10 Virgins slept. Not just the "foolish five." None of their lamps were completely out. They were "going out" or sputtering with the dregs of oil. 5 brought extra oil. 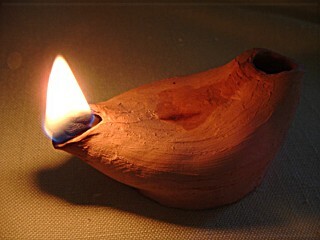 5 brought only the oil in their lamps. Perhaps, this was not their foolishness. When the bridegroom took so long, fearing the darkness, the foolish five went shopping with lit lamps. Moments later, when the bridegroom arrived and they were off finalising their purchases, those who remained at the ready went inside with Him. Perhaps we get too transfixed on our personal wakefulness (knowledge) or our own little lights (good deeds) and risk missing the point ... Jesus is the Light. Stick around. Nobody sleeps through the second coming! And darkness flees when He approaches.